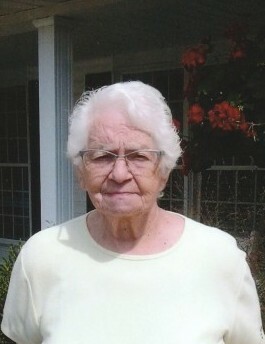 Freida Catherine (Miller) Kandel Raber, age 86, of Millersburg, Ohio passed away Thursday, March 28th, 2019 at Majora Lane Care Center, Millersburg, Ohio. Memorial services will be 11 a.m. Monday at Longenecker Church, 2200 Township road 606, Dundee, Ohio with Pastors Matt Hamsher and Mervin Kurtz officiating. Private family graveside service will take place at Berlin Cemetery prior to the memorial service. Friends may call from 2 to 4 and 6 to 8 p.m. Sunday at the church. Freida was born June 12th, 1932 in Corfu, New York to John N. "Bama John" and Sarah (Miller) Miller. In 1949, Freida married John J. Kandel, he preceded her in death September of 1983. In March of 1988, she married John H. Raber and he preceded her in death December of 1999. Freida worked 30 years at Pomerene Hospital and was known for her wonderful back rubs and witty sense of humor. She was an avid bowler and loved fishing. She is survived by children, Marilyn (Sanford) Hartman of Millersburg, Morris (Deborah) Kandel of Stevensville, MT, Mildred (Ed) Whitman of Millersburg, Maxine (Rick) Frantz of Massillon, Margaret (Al) Wengerd of Apple Creek and Martha Coss of Sandusky; step-children, Ernie (Delores) Raber along with their family and Jim (Shirley) Shrock; 18 grandchildren; 43 great-grandchildren; siblings, Wilma (Harry) Schrock of OR, Mary Chupp of Wooster, Mark (Dorene) Miller of Wooster, JoAnna (Aden) Miller of Apple Creek, and James (Wendy) Miller of Wooster; stepsister, Emma Troyer of Dalton; sister-in-law, Verba Miller of Apple Creek; and numerous nieces and nephews. She was preceded in death by her parents and stepmother, Sarah Mae (Kuhns) Miller; a brother, Paul Miller; stepsister, Wilma Rose Hershberger; brothers-in-law, Verton Troyer and Roy Chupp; stepbrother-in-law, Atlee Troyer; a son, Michael John Kandel; and a granddaughter, Katie Rae Kandel. A special thanks to Majora Lane and LifeCare Hospice for their kindness and compassionate care over the past couple months. Family suggests memorial contributions be made to LifeCare Hospice, 1900 Akron Rd., Wooster, Ohio 44691.